For the third week running, the issues surrounding the South Asian Institute of Technology and Medicine (SAITM) turned explosive – street protests by state sector students — while the Sri Lanka Medical Council (SLMC) finally decided to appeal against an earlier court ruling to provide provisional registration to a SAITM student. The SLMC decision on Friday to appeal to the Supreme Court came 17 days after the Court of Appeal ruling which has been favoured by some and opposed by others. The ruling has also triggered calls for more private medical universities. Parents of SAITM students welcomed the court decision and urged the authorities to respect it. This was while the Private Medical College Parents’ Society told a media briefing on Tuesday at the BMICH that they are also ready to discuss and negotiate on the suggestions made by the Deans of the state medical faculties. The issues discussed by the panel comprising society President P.M.B.K. Tennakoon; Secretary Anura Dhanaratna; Treasurer W.P. Samarakoon; and member Prof. Neville Perera covered SAITM being on par with any other university in the country, how a banner against SAITM put up on a government hospital premises was in contempt of the Court of Appeal decision; how SAITM was established with the approval and in compliance with government regulations; and that the right to medical education should be open to all and not limited to the government sector. When asked what their stance was on the Deans’ suggestions, Prof. Perera said they were willing to discuss the matter. Earlier he said that having taught government medical students for over a decade, he can give an assurance that the students who have passed the MBBS at SAITM are a clinically-sound batch of medical graduates who will become competent doctors. Mr. Dhanaratne said that they would be meeting the Justice Minister shortly to discuss the contempt of court matter. When Mr. Tennakoon raised the issue of a state medical faculty not having ata-katu (bones) for its students to study, a question was asked by the media from where SAITM secured its bones. The parents then requested the media to verify that and several other issues such as how many lecturers at SAITM are on the permanent cadre, from the SAITM Management. Several attempts by the Sunday Times to contact SAITM Chairman Dr. Neville Fernando for a comment proved futile. The Sunday Times was told that “he was busy at meetings”. Even though the journalist’s name and mobile number were left with Dr. Fernando’s Secretary, there was no response up to the time of going to press. Meanwhile, with regard to the SLMC decision to appeal to the SC, the Sunday Times understands that there was consensus among the 21 members present at Friday’s meeting, with only one dissenting voice. The decision came amidst a flurry of meetings between different groups including one between President Maithripala Sirisena and students and Health Minister Dr. Rajitha Senaratne and the Deans of the eight state medical faculties. While there was also a flood of statements by academics of different state medical faculties in support of the important role played by the SLMC, there were many letters and articles in the media supportive of the court ruling. But more threatening to the government was mounting street protests on Wednesday and Friday, severely blocking traffic in the city and inconveniencing motorists. 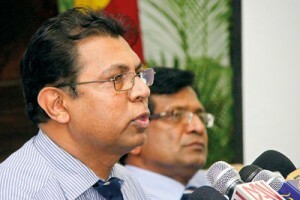 As the debate over SAITM and private medical education raged, a respected academic, Prof. Ranil Fernando, Head of the Department of Surgery of the Ragama Medical Faculty, University of Kelaniya, suggested that the SAITM issue should be dealt with in isolation rather than including this in the whole private medical education issue. “Lift SAITM out of the private medical education issue. Deal with SAITM in isolation on a priority basis and private medical education separately,” was the strong plea by Prof. Fernando. He also voiced serious concern over the current situation, seeing the “early signs” of a re-enactment of the 1988-89 era, a trend being set in motion by interested parties. “We should never-ever go down that road again. Have we not learnt anything from those bitter experiences,” he asked. Pointing out that as there is no provision for private medical education, he said “this is a good opportunity” to take an overview and set clear guidelines. The immediate need is to separate the SAITM matter from this mix and deal with it separately on a priority basis. There are many unresolved issues surrounding SAITM such as whether entry criteria were followed and whether there are deficiencies in various aspects of training. Finding a fair and reasonable solution with regard to SAITM students is also a priority. Prof. Fernando explained that thereafter the authorities must necessarily get-together, hold extensive discussions and come up with a National Policy on Private Medical Education in Sri Lanka. This is the second priority. Most of the protests are because people are uncertain of what the future holds. This policy must be based on the national requirements of doctors in the country, after considering various aspects of medical care. This needs to be followed by deficiencies or problems with regard to the current functioning of the SLMC being addressed because the Medical Ordinance is weak, he says, adding that these deficiencies need to be corrected and the SLMC strengthened as the body that monitors medical practice. “The SLMC should be the foundation for monitoring medical education and medical practice. Otherwise, if such monitoring is handed over to Ministers or politicians or some other body, medical education will go down the slippery slope and our very integrity as doctors will be in doubt,” says Prof. Fernando, pointing out that while respecting the Court of Appeal judgment, there is also an urgent need to look at the judgment and its impact on future of medical education, “as there could be a deleterious effect”. Reiterating that medical education should never be allowed as an open-door policy or a business venture, he said that it is vital to check out the dearth of human resources with regard to teaching staff, which would get compounded not only in the state sector but also the private sector.